I made it up the hill! Home Badges I made it up the hill! 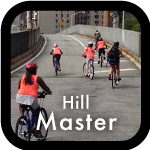 This badge is awarded to riders for their first successful ride (not walk) up the hill between the two dog parks along the East River, just north of the Queensboro Bridge.